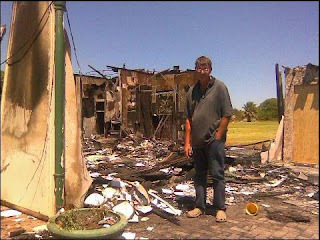 At 2am this morning, 29th January 2010, Johan woke to find his house on Bluewaterbay on fire. He lost everything (for some inexplicable reason, the first thing he grabbed and only thing he saved was his office chair!). All his photos, laptop, books, paintings, furniture, heirlooms, carefully kept mementoes of a colourful life - destroyed. We are grateful he was unharmed. Whilst insurance can replace bricks & mortar, nothing can replace all the personal items we take for granted that help record our life journey. Our love and thoughts are with him.